The Quill Pen is an item in the NES release of Mario's Time Machine. It is a writing utensil used by William Shakespeare in 1602. At some point, it is stolen by Bowser, who exhibits it in his museum full of time-displaced and stolen items. Mario then steals it back from some Koopa Troopas and travels back in time to 1602 to return it, which involves leaving it on a stage. 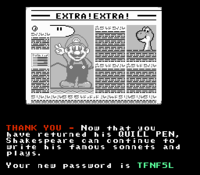 A news article then appears congratulating Mario for returning the Quill Pen, saying that Shakespeare can continue to write his plays. This page was last edited on July 29, 2017, at 12:50.